In the fall, it is not unusual to come across abundant supplies of black walnuts in the wild. Processing walnuts, on the other hand, is a long process that may seem daunting at first. However, once you are familiar with the process you can get up to 200 walnuts a day through the hardest initial phases. The entire process can take up to six weeks before you have walnuts that are ready to be consumed. Most of the wait is due to the curing process that is used to intensify the flavor, which makes the work well worth it. Wait until the walnuts you want to harvest ripen on the tree to begin harvesting them. The husks will turn from a green color to a yellowish-green in the late fall when they are ready. Wear gloves to harvest the walnuts that fall on the ground each day for three weeks after they have ripened. You can also get walnuts from the tree by shaking branches in an up and down motion. Put on safety glasses and gloves before removing the hulls. The gloves will help to keep the hull dye from from getting all over your hands. Use a hammer to crack open the green hull that surrounds the walnut. Pry off the hull once you break it open. Place the walnuts in a bucket of water as you remove them from the husk. Throw the husk into the garbage. Walnut husk contain toxic thujone, which can kill plants in your garden if you use it as compost. It can also kill earthworms under the soil. Stir the walnut with a stick to remove any husk left on the shells. Lay your walnuts on a screen and place them in the sun for a few hours. Collect your walnuts into a mesh bag, and place it in a cool, well-ventilated area for six weeks until they cure. Place one walnut in your vise so that the tip is facing upward. Tighten the vise until the walnut cracks. Remove the nutmeat and break it in half. If it makes a sharp snap, your walnuts are done curing and ready to be cracked. Place your walnuts in a bucket of water and let them soak for the next 24 hours. Drain the water from the bucket, and add fresh water over the walnuts. Soak your walnuts for another 2 hours. Drain and remove your walnuts from the bucket. 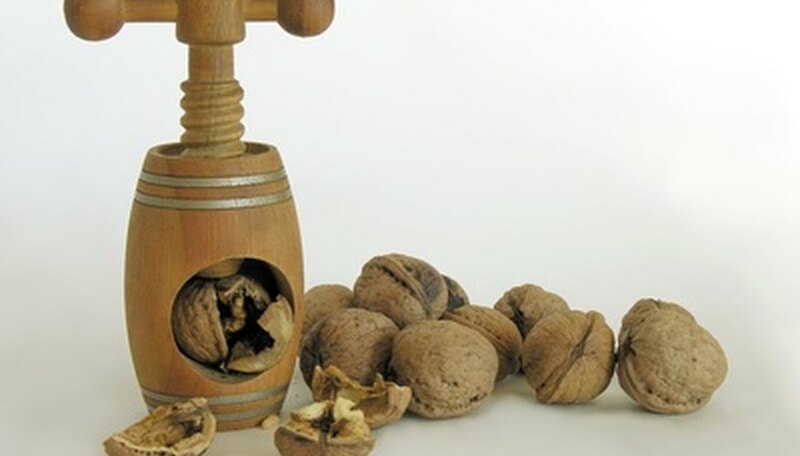 Place a paper bag below your vice, and crack the rest of the walnut shells the same way you did the first one by putting the pointed end of the shell upward. Make sure you get all of the walnut pieces in the bag. Sift through the shells to remove the nutmeats. Lay the nutmeats out evenly over a cookie sheet. Bake your walnuts for 15 minutes at 215 degrees F.
Put your walnuts into canning jars and seal them tightly. Store your walnuts in a cool and dark location. Freeze your walnuts if you don't plan to use them immediately.